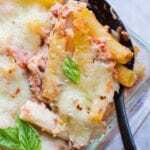 Healthy Baked Ziti is a lighter twist on a classic Italian dish. Made with ground turkey and whole wheat pasta, it's a hearty meal the anyone will love! Easily made gluten free + simple to prepare! Preheat oven to 350. Bring a pot of water to a boil. Boil ziti until al dente- approximately 6 minutes. Check your pasta box and I would suggest to cook ½ the time they recommend. Remember, the ziti will continue to cook in the oven! While pasta is cooking, heat olive oil in a separate pan. Brown the turkey until completely cooked (approximately 10 minutes) + set aside. In a mixing bowl, mix together 1 cup of mozzarella, ricotta, parmesan cheese, basil + pepper. Toss the cooked ziti with the cheese mixture and stir. Stir in ground turkey, tomatoes + spices to pasta/cheese mixture. Pour pasta mixture into 9x13 baking dish. Sprinkle remaining cup of mozzarella cheese on top of the pasta mixture. Bake at 350 for 30 minutes until cheese is melted. Can you make this baked ziti with sausage? Yes! You could make this with sausage or any other type of meat you like. Ground beef or chicken would work. Can you make this baked ziti with spinach? Yes, I have made this with chopped spinach added in and it is delicious.